Tis the season for allllll the baked goods and I am SO excited about it! That might sound counter-intuitive to you — a Nutritionist who’s excited about baked goods? Isn’t that the antithesis of a nutritionist? I LOVE to bake! And I REALLY love to bake when it’s cold outside. I’m sure I’m not alone in that! The other thing I love about baking is trying to get a recipe just right with as little sugar as possible and experimenting with grain-free flours. We just feel SO much better when we’re not eating much sugar! We really try to keep our intake at less than 20g per day (Mo, probably closer to 30-40g depending upon his training intensity that day)! We can really feel the difference when we get above that! And you know what I’ve learned? It is absolutely not worth the way I feel when I eat things made with refined/processed sugar and vegetable oils. I’m fine with All Purpose Flour on occasion and having some maple syrup or honey or coconut sugar… But when I go to holiday parties and see all of the baked goods, etc. – honestly, and I’m TRULY not bragging here – it’s rarely a temptation, simply because I KNOW how crappy I will feel after. And THAT is what I wish for my nutrition clients – to get to that place that it’s not about not eating something out of restriction but rather out of self-care! So ALL of that being said – let’s talk about these cookies! They are ABSOLUTELY delicious and only use 1/3 cup of coconut sugar in the WHOLE batch! AND majority of the ingredients is almond butter, which I love because it’s a healthy fat that is going to help keep blood sugar level when you eat these! I love making these to have around the house during the holidays for a cleaner substitute to all the baked goods that seem to be more prevalent this time of year. I also like to make these to take to holiday parties or to have around for my Thanksgiving or Christmas with our family, so that I know there is something there that I can feel really good about having! Hope you love these as much as we do! In small bowl mix together the oats, baking soda, salt and cinnamon; set aside. In a large bowl beat the almond butter, coconut sugar, eggs and vanilla with an electric mixer until smooth – 2 minutes. Mix in dry ingredients with a wooden spoon, then fold in chocolate chips. For best results, refrigerate the dough for 30 minutes to 1 hour. And then move on to the next step. If you don’t have time, no worries, they will still turn out GREAT – but will be a bit more sticky to work with. Bake the cookies for 10-12 minutes – until the edges barely begin to turn a golden brown. The cookies may look a little underdone, but they will continue to cook once you remove them from the oven. Cool for 5 minutes on the cookie sheet and then transfer them to a wire rack to cool completely. Repeat with remaining cookie dough. Store in an airtight container on the counter for up to 7 days, in the fridge for up to 2 weeks or in the freezer for up to 3 months. I totally made this recipe by mistake. And it just might be the easiest damn thing I’ve ever made. AND it tastes SO good! Don’t you love it when that happens? It’s like all of the stars just align in your favor some days, right? But all of that to say – the Friday after Thanksgiving, we had one of my favorite Mexican food restaurants cater for us… We were done with the cooking. My Uncle was in charge of ordering the catering and we always know when he’s in charge of something, it will be over the top! He always goes above and beyond and that means there is NEVER a lack of ANYTHING! You can see where this is going, right? Yep – we had ALLLL the leftovers! …not just from Thanksgiving, but now from the Mexican restaurant! And, Mo and I are the only ones who live in Dallas out of this side of my family so we ended up with ALL of it! Y’all!! It took me less than 5 minutes to put this together and it was SO stinkin’ good! So, next time you’re in a pinch and need something super quick and healthy – make this your new go-to! Then add the rest of the ingredients on top, in any order. Stir to combine. Put on low for 5-6 hours or high for 3-4 hours. After it’s done cooking, use two forks to shred the chicken. Serve in big bowls on top of roasted cauliflower rice (optional) and top with cilantro and sliced avocado. I grew up on cornbread! My mom always made it to go with soup, which we had pretty often growing up! Smelling it baking in the kitchen brings me right back to my mom’s house when I was little. It is the best nostalgia! Corn can be a tricky thing though because of the gmo’s (genetically modified organisms) corn can be so high in. So, I went for quite a while without eating it and frankly, always avoid it when eating out, etc. unless I am sure that it is made with non-gmo cornmeal. If you’ve avoided gmo’s and then accidentally had them at one point or another, you know that they can make you pretty uncomfortable – sleepy, tired, lethargic, GI distress, disrupted digestion, inflammation, joint pain, etc. My recipe specifically calls for non-gmo cornmeal – I like Bob’s Redmill brand for this. And just so you know, if a product is listed as organic, that also means that it is non-gmo. But, most products that are known to have gmo’s will have a label on them that states specifically: non-gmo. I LOVE cornbread that has lots of texture and “stuff” in it, so I put green chiles, bell peppers and corn kernals into mine! But if you like it plain, you will still love this recipe! These are a great pair with my Clean Eating White Chicken Chili or any chili, soup or stew! AND, a great bonus is – during the holidays, you can make this ahead of time, freeze it and it’s ready to go when you need to make cornbread dressing. And now, you’ll have a cornbread dressing you can feel really good about eating! Preheat oven to 425 degrees F and spray a 12-count muffin tin with avocado or coconut oil cooking spray, set aside. In a large bowl, combine dry ingredients and mix very well. In a separate bowl, combine the liquid ingredients and mix very well. Pour the wet ingredients into the dry ingredients and mix until all clumps of cornmeal are gone. Add in the corn, green chilies and bell pepper, if using. Mix well to combine. Pour into muffin tins that have been sprayed with nonstick cooking spray. Pour evenly into 12-count muffin tin and bake 20-25 minutes or until a toothpick inserted into the center muffin comes out clean. Serve immediately or let cool and store in an airtight container up to 1 week or freeze up to 3 months. When the cooler months hit, I really get into baking! Honestly? I wake up thinking about it! As in, almost daily! Ha! And I have to refrain from baking all the things I want to bake because then, I would eat all the things I bake! Thankfully I live with a “cookie monster” so Mo usually eats his fair share! But, it’s all SO good! One way I do this: I lean into the food-craze – know it’s coming, embrace it, and enjoy every bit of it! But, I do this by keeping things around our home that we can feel really good about indulging in so that when we do go to parties, dinners, get-togethers, etc. the desire to eat ALL the food is not near as strong and absolutely avoidable. For example: when I go to someones house and they have decadent desserts set out that I would LOVE to eat lots of, I can much more easily have a couple of bites of a couple of desserts and move on, because I know that we have good, clean-eating things at home that I can have and feel really good about having, whenever I want them! These brownies are one of the things I try to keep around during the holidays! They are fudgy, chocolately, decadent… Absolute heaven! AND, really good for you! Hope you make these part of your holidays this year and enjoy as much as we do! Preheat oven to 350 degrees F. Spray an 8-inch square pan with coconut or avocado oil cooking spray. Place dark chocolate and coconut oil in the bowl of a double boiler and melt over low heat, stirring almost constantly and never letting the water in the pot come to a boil. While chocolate is melting, puree the avocado in a large bowl with a hand mixer. Once chocolate is melted, pour into the same bowl with the avocado and add in sugar, salt and vanilla extract. Mix until combined. Then add in baking soda, cacao, tapioca flour, coconut flour and gelatin and mix no more than 30 seconds, until just combined. Use a spatula to scrap down the sides of the bowl and mix once more to combine. Pour batter into the prepared pan and smooth into an even layer. Bake for 25-30 minutes until edges are just pulling away from the sides and middle is still just a touch moist. Cool and then cut into squares. Store in an airtight container for up to 3 days. Mo and I LOVE brunch and eating big breakfasts!! But, who has time for that during the week? They take 15 minutes to make start to finish! If you don’t have a waffle maker, use the batter for pancakes instead! I like to spread some almond butter or plain Greek yogurt (sweetened with a little French vanilla stevia) on top and douse it in cinnamon and a pinch of sea salt! In a large bowl, combine the coconut milk and apple cider vinegar. Let rest for five minutes. Add the eggs to the coconut milk mixture and beat them for a few seconds until smooth. Then add the remaining ingredients. The batter might be a little thick. If so, add 1 tbsp filtered water to thin out a bit. Spray your waffle iron if necessary, to prevent sticking. Pour approx. 1/3 of the batter into the waffle maker (mine is pretty big and requires approx. 1 cup of batter per waffle or pour just to cover the bottom and then close. Remove the waffle and repeat with the remaining batter. This duo of recipes is one of my very favorite things to make for Mo and I (or, just myself 🙂 ) when I get the craving for something bready and unctuous! You know that craving? No? Just me? Ha! If you don’t know it – I’m not sure how to explain it… It’s just this want for something doughy that has a little chew to it and something to dip that texture in just tops it off! …takes it over the edge! The naan in this recipe is not mine to claim at all! Ashley from My Heart Beets is due FULL credit for this and deserves every bit of it! She’s a genius for many of her recipes, but this one alone made me a believer! The tzatziki is not traditional in the sense that it does not have cucumber in it. Could you add it? Absolutely! I would use a Hothouse cucumber. Halve it length-wise and then scoop the seeds out with a spoon. Finely dice or grate using a box-grater – a quarter to half of the cucumber depending upon your preference and mix it into the tzatziki recipe below. I love to serve this with my Primal Greek Casserole (recipe coming soon!) or as an appetizer when we have company over… Or, like I said, when the craving hits me and I want something clean-eating to fill the craving with! Hope this becomes one of your new go-to’s when you get that craving too! You’ll feel much better for it! Heat a large nonstick skillet over medium heat and pour batter to desired thickness. Once the batter fluffs up and looks firm/mostly cooked – approx. 2-3 minutes, flip it over to cook the other side. Continue until all batter is used. Serve or store in an airtight container, once cooled, for up to one week. Pour the extra water off the top of the Greek yogurt as you want it to be as thick as possible. Place all ingredients except into a medium bowl and whisk well to combine. Garnish with extra dill, if desired. This can be made one day ahead! I come from a long line of crazy Italians and I LOVE Italian food! No surprise there, given my heritage – but, probably some surprise due to my predominantly grain-free lifestyle. A little story about me as a little girl… Growing up, my very favorite breakfast was cheese tortellini with butter and lots of salt and pepper. Man, I can taste it as I type this! I don’t tend towards this breakfast now, as most of you who follow me know! 🙂 And not that I would be opposed – but it’s interesting, taste buds change. Not only between growing up from a kid to an adult – but as we eat differently, taste buds will change. Did you know that? You can eat a certain way your whole life and then change your habits and your body will begin to CRAVE the new things you feed it. This works both ways of course – you could go from eating a very clean “diet” to perhaps going off the rails for several days (think: the holidays) OR you could go from eating a highly processed “diet” to eating a very clean “diet” — either way, you will teach your taste buds (and your brain) what to crave. So, while I LOVE pasta with butter and man – how many times have I had Fettucini Alfredo?! 🙂 I just don’t genuinely CRAVE those things anymore. Not that they are bad AT ALL – but, in moderation. So, this is my way of satisfying my Italian craving, while still maintaining little to no grains. I served this with a small herb salad – butter lettuce, spinach, cilantro leaves, chives, a few shavings of raw manchego and tossed with evoo and balsamic vinegar and my “cheesy” roasted cauliflower! It was de-lish!! Spray a large non-stick skillet with avocado oil cooking spray and place over medium heat. Season both sides of the chicken tenders with oregano, paprika, salt and black pepper. Place chicken into pan (you don’t want to crowd the pan, otherwise the chicken will steam and not get that yummy crust, so you may have to do this in two batches) and cook approximately 4 minutes on each side, or until chicken is almost entirely cooked through (a meat thermometer reads 155 degrees F). Add the tomatoes and garlic into the pan with a little salt and cook for approximately 5 minutes until tomatoes are softened completely and the liquid from the tomatoes has reduced a bit. Add chicken back into the pan and coat with the sauce. Add in basil and stir to combine. Turn heat to lowest setting and let simmer for another 5 minutes or until ready to serve. Just before serving, squeeze half lemon over the top of the chicken. Serve with cauliflower rice, cauliflower mash or roasted heirloom potatoes! We LOVE curry at the Brossette’s. It’s one of our favorite flavors. Good thing too because it is full of anti-inflammatory benefits! Sometimes I have no clue where I come up with ideas for recipes. I used to hate my appetite. A battle with anorexia will do that to a person. I used to get so frustrated that I craved things and was hungry for food… That food was (still is, duh!) important to me. I just wanted to be that person who “didn’t care about food” – you know, the people who “forget to eat lunch…” Ha! I will NEVER forget to eat a meal. Never. And I used to really dislike that about myself. Now? I lean into that. I LOVE that I crave things and I REALLY love that when I allow myself to have said craving, I usually don’t crave it anymore for a while. Hence, moderation. Too much of ANY thing – even spinach – is not good. And our bodies know this. It’s so beautiful to me – if we allow our bodies to work like they are intended to and we lean into the things we crave without over-doing or under-doing – we will naturally be exactly what we’re supposed to be in terms of aesthetics. It’s when we start forcing our bodies to become an idea that WE have in our heads as to what we WANT to look like that things start going haywire. This is why we, at LINK Endurance, coach nutrition the way we do… It’s a long, slow process but one that will bring you to what I described above. Ok, so what does all of that have to do with Coconut Curry Meatballs? Well, not a whole lot honestly, except that to say, I woke up one day CRAVING curry but I also wanted meatballs. I wanted something saucy and filling and full of flavor. It’s the Italian in me coming out, I’m sure. So – that is where these meatballs came from. I adapted a recipe from Randa at The Bewitchin Kitchen, as I’d never made a dish quite like this before. I mean, I’ve made curries and I’ve made meatballs of course, but have never put the two together. So I leaned on her for some inspiration and a jumping off point! I must say, she and I would make a great team if we could come up with a recipe THIS good every time! These meatballs are incredibly easy to make, the sauce culdn’t be simpler and the cauliflower rice – well, it’s easy, yes, but roasting it gives it SO. MUCH. FLAVOR! It’s the only way I make cauliflower rice these days! And! The leftover meatballs are JUST as good, if not better the next day! Preheat oven to 425 degrees F and line two large sheet pans with foil or parchment paper. Spray both with avocado oil cooking spray and set one aside and pour the bags of cauliflower rice onto the other one and spread out evenly – spray the top with additional avocado oil cooking spray and a few dashes of salt (unless using the coconut aminos after roasting – see notes) and a few pinches of black pepper. Toss to combine and set aside. Place all of the ingredients for the meatballs (except the chicken and cilantro/basil garnish leaves) into a food processor and pulse until chopped and combined. Pour mixture into a large bowl along with the ground chicken. Mix well with a spatula or your hands. Bake for 10 minutes on the middle rack of your oven, roll the meatballs over and bake them for an additional 5-10 minutes. Remove from oven and set aside. Place the cauliflower rice onto the top rack of your oven when you put the meatballs in and let roast 10 minutes, toss and then place on the bottom rack of your oven and let roast another 5-10 minutes. Once you pull the meatballs out, just leave turn your oven off and leave the cauliflower rice in the oven to stay warm until ready to serve – just be sure it’s on the bottom rack at this point. While the meatballs are baking, make the sauce by heating the coconut milk over medium heat in a large skillet. Add the remaining ingredients for the sauce and simmer for 10 minutes, stirring until combined and the almond butter is melted. Add the meatballs to the sauce, stir them around to coat them with the sauce and simmer for 2-3 minutes. Serve over roasted cauliflower rice with fresh cilantro and/or basil on top. If you buy frozen cauliflower rice, thaw before roasting and drain any excess water before placing on the sheet pan. I like to toss my cauliflower rice with several dashes of coconut aminos as soon as I take it out of the oven. It just gives it more umami/flavor! Not a must, but definitely recommended! If you do this – do not add salt prior to roasting. When making the meatballs, I suggest using a small ice cream scoop to scoop out the meatball mixture so you ensure each meatball is close to the same size and therefore cooks evenly. Preheat oven to 425 degrees F and line two large sheet pans with foil or parchment paper. Spray both with avocado oil cooking spray and set one aside and pour the bags of cauliflower rice onto the other one and spread out evenly – spray the top with additional avocado oil cooking spray and several dashes of salt and a few pinches of black pepper. Toss to combine and set aside. If you buy frozen cauliflower rice, thaw before roasting and drain any excess water before placing on the sheet pan. I like to toss my cauliflower rice with several dashes of coconut aminos as soon as I take it out of the oven. It just gives it more umami/flavor! Not a must, but definitely recommended! When making the meatballs, I suggest using a small ice cream scoop to scoop out the meatball mixture so you ensure each meatball is close to the same size and therefore cooks evenly. 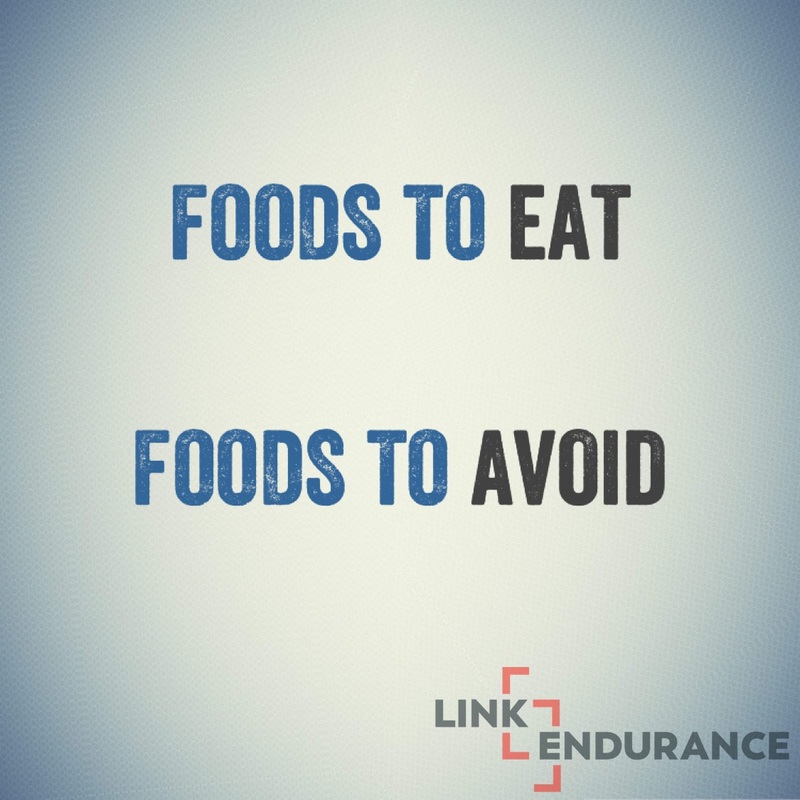 At LINK Endurance we coach holistic nutrition… This means that we advise a client on what they should eat AFTER we have considered their work-life, home-life, athlete-life, training-level, stress level, relationship with food, etc. One of the links we come across most often that people need help with is the food they keep in their home. It is important to realize that if you don’t buy something, you can’t eat it and vice versa of course. So I’ve put together a list of foods that we encourage clients to eat 80-90% of the time in any way, shape or form! These are the foods that you want to keep in your home… That you eat day in and day out, week after week. On the flip side – there is a list we’ve put together that we encourage clients to eat only 10% of the time. These would be “Foods to Avoid.” These are the foods that we strongly encourage clients not to buy and bring into their homes. More often than not, if a food is available to you in your home, you will eat it eventually. From what we’ve heard, most people we come into contact with think that Mo and I have some form of “superhero” cape on at all times and we never have temptations or, if we do, we don’t give in. Let me clear this up: this is FAR from the truth. We DO have certain foods that tempt us and we’ve both learned that when we make those foods part of our daily or weekly lives, we really don’t feel good for doing so. Namely, tortilla chips and salsa for Alix and Snickers bars for Mo. So, we don’t buy these things. We don’t keep these things in our home. But, we go out for Tex-Mex every now and then and enjoy ourselves! Or, one of Mo’s favorite treats is a Snickers the day before or after a race! But 90% of the time, we eat the foods listed in the “Foods to Eat” list below. Let’s do a little math, shall we? So, if we’re shooting for 80-90% of those meals to be made up entirely of “Foods to Eat” then that means that approx. 24-26 of those meals/snacks are within that list. Conversely, 2-4 of those meals/snacks could be made up of “Foods to Avoid” in some capacity. I hope this shifts your perspective a bit about your nutrition and how it doesn’t have to be a grind day in and day out. We’ve found that when we take the decision-making at every meal out of the equation, people eat much cleaner, much more often. But when you don’t really have a path to stick to and every meal creates a point of decision-making, it’s much easier to give into temptation. I like to call this behavior: “Pre-Made Decision Making.” If you stick to the list of “Foods to Eat” when you grocery shop, cook meals, eat out, etc. it takes a huge amount of the decision-making process out of the equation and allows you to use that brain energy for other good and you’ll also feel a hell of a lot better! Side note: if you’re trying to lose weight, we encourage sticking to the “Foods to Eat” list 90-95% of the time (or 1-2 meals/snacks per week). If you’re trying to maintain weight, we suggest sticking to the “Foods to Eat” list 80-90% of the time (or 2-4 meals/snacks per week). Two Days of the Weekend (Friday, Saturday or Sunday): Dinner involves some form of “Foods to Avoid” – i.e. Sweet Potato Fries or Tortilla Chips or we might have dessert, etc. But please note: when we choose to eat “Foods to Avoid” we eat them in moderation – meaning, we do not (or we try our best not to) over-eat – we keep portions under wraps and push back from the table satisfied vs overly full. Annie’s brand Mustards – any kind: Yellow, Dijon, Grain, etc. Any chip that is made with coconut oil or avocado oil, non-gmo corn, sprouted grains or potatoes and salt are good in our book!